When Isabelle Martin steps onto Sawyer Auto Repair's parking lot, she can't believe it's come to this. After dropping out of a school she never really wanted to go to in the first place and dumping a boyfriend she never really loved to begin with, she thought coming home to Claremont, North Carolina would solve all her problems. Instead, she's still reeling from her mom's death six months earlier and trying, but failing to help her dad, who's sunken deep into a whiskey-fueled depression. Working in the local, motorcycle club-owned, auto shop's office is a last resort, but it's the only option she has...even it means working with Caleb Sawyer, the bad-boy biker with swagger to spare who used to drive her up the wall in high school. Caleb Sawyer is on the fast-track to a downward spiral. He used to think he had the world at his feet--all he has to do is be patient, earn his keep in the club and in the shop, and his legacy within the Iron Horsemen MC will be his for the taking when the time is right. But that just doesn't mean anything without his old lady by his side, who wants to leave Claremont more than she wants to stay with him. When the bottom finally drops out, nothing prepares him for the impact and he deals with it the only way he knows how--with whiskey and women. Despite all that, being around Isabelle Martin, the girl whose feathers he ruffles so easily in high school, somehow brings him back to life. She doesn't take any of his crap, but she calls him on it without judgement and without pity. Despite some initial animosity, Caleb and Isabelle quickly realize that the perceptions they had of each other in high school couldn't be further from the truth. The more time they spend together, the closer they become and the more they gravitate towards each other. Both are at a crossroads, but stuck in reverse. Isabelle needs help; she just doesn't know how to ask for it. Caleb needs a life preserver; he just doesn't know where to find one. And ultimately, on the path to rediscovery and identity, all roads lead them to exactly what they need--each other. Alright, Alright, Alright! (Oh yes, I went there!) What a wild roller coaster of a novel! Thank you so much to Katie Ryan for sending me this book for an honest review! This was definitely a unique read for me, laced with a lot more of the NA romance I love so much! Then comes Caleb. A man with a past, and not someone who has thought much about his future expect one thing. Wanting to stay in the family business. I totally get that, and I found myself at times really thinking about how family oriented he is with his "Family". Of course there is a LOT more to the story behind Caleb, and you come to realize that Isabelle and Caleb have a lot more in common than they both believed from those years in high school together. There were a couple quotes that I really liked throughout this novel. They are just so powerful, it's hard not to feel SOMETHING about it. "I don't care who they are or what you think they mean to you, nobody is worth killing yourself over and anybody that would willingly put you in this position doesn't deserve you anyways." "I just mean that you make me feel normal. Like I'm not some sort of goddamn freak that everyone needs to tip-toe around and whisper about like I'm not standing right there." Of course there goes love pulling on your heartstrings! I mean the love between the two wasn't something that was just physical or sexual. It was passionate, caring, undivided, and willing to put things aside to ensure that the other is okay in all aspects, and are truly happy no matter the costs. When all hope seemed to be lost, there they were, just wanting to be there to pick up the other, dust off their jeans, and continue on as if their life wasn't just shattered within their hands. It also entails that there is some monster trying to ruin anything perfect for someone who just wants to be happy. For me I really hated Isabelle's father as well as Ariel. I mean if you put those two in a room, who knows what kind of trouble they would be up to! The way that Ariel just up and left, then try to come back thinking life was all roses?? HELLO!! Get your head out of the clouds to see that it was your fault some of the disaster happened...Also the fact that Isabelle's father just couldn't come to terms with the loss of his wife. I mean, I totally understand what loss feels like, but he has become someone that you would fear for but also want to make sure he is okay, even if that means it's tearing you up inside more than anyone knows. The interaction between Isabelle and Caleb, I found at times to be really funny. Their witty banter to one another kept me intrigued, and actually laughing out loud. I love how Caleb will say whatever is on his mind, and will be this tough guy...but you totally can see through his façade to know his is just a big teddy bear inside...#Swoon!! Katie Ryan really had me turning the page faster than I could even read the words. I was drawn so quickly, and just couldn't put it down! There was a part towards the end where Isabelle realizes what her life is supposed to be, and what she truly feels is best for her. So when the decision was made, I was heartbroken, and then amazed and excited within 5 chapters! Sleep was no option for me, as I just had to finish and find out what was going to happen.....and then BAM!! PLOT TWIST!!! Of course she had to do that, but it still got me, and now I'm left wondering what will happen for the characters of Carry Your Heart! That was honestly the biggest cliffhanger I have read so far, and it really gets you. I was reading the last page and found myself thinking "What happens!!!" So thank you Katie Ryan, for instilling fear and anxiety and wonderment into what is next for Isabelle, Caleb, Becca, Skylar and everyone else. Overall I found this to be a great read. Although it was a little slow to begin with and drag on a little at the end, I found myself captured within the book, forgetting about the outside world for hours on end. Isabelle and Caleb both kept getting knocked down left, right and center, and they just kept on rising, refusing to let fear or destruction get in their way. This was a great novel with a lot of romance, love, heartache, heartbreak, disappointment, and recovery. I really loved the writing style and I just could not get enough!! 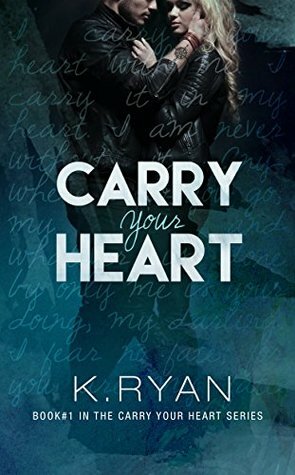 And that is my review for Carry Your Heart! I hope you enjoyed it, and I totally recommend checking this out!! Can't wait to read this!!! !